Stockholm (AINA) -- On Thursday, April 8, 3,000 Iraqi refugee cases were appealed to the Swedish Migration Board. For weeks Swedish and Assyrian churches have had their facilities open for Iraqi refugees hiding from the Swedish police. In a joined national campaign, the churches helped the refugees, most of them Assyrians (also known as Chaldeans and Syriacs), to leave their hiding places and come to the churches to get help with new applications. The aim of the campaign is to make the Swedish Migration Authorities review the cases and look for errors that have been made in every individual case. Håkan Törnqvist, priest at the organizing church at Bergsjön, a suburb of Sweden's second largest city, Gothenburg, said to the national media that Christian and other religious and ethnic groups can not be send back to Iraq before protection in their homeland is guaranteed. It is against both international and national Swedish laws. Last February, at a meeting at the Swedish Migration Board office in Solna, Stockholm, Staff Director Fredrik Beijer challenged Assyrian-Swedish journalist Nuri Kino to produce fifty immigration cases to scrutinize the impartiality of the decisions. After the meeting Nuri Kino came up with the idea to assemble as many cases as possible to show the Migration authorities the massive errors being committed in the asylum process. "During more than a year that I and my colleagues at the Swedish Radio have gone through rejected asylum for minorities from Iraq," said Kino, "we, together with lawyers and other experts, have found many faults being done in the process. For example, reports from the US State Department that are highlighting the persecution of minorities in Iraq are not being taking seriously when decisions of asylum are being made." 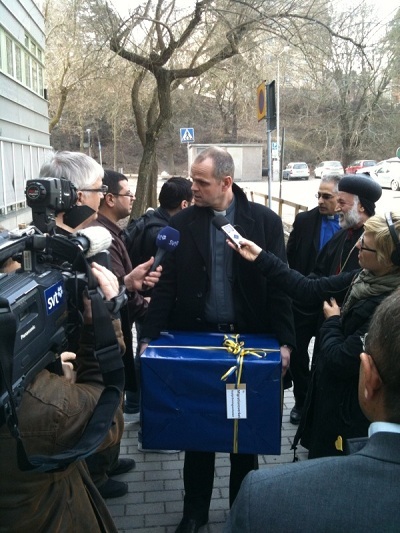 It was a cloudy afternoon when Henrik Törnqvist, Lena Blom and Christina Byström, from the Swedish church, together with archbishop Abdulahad Shabo for the Syriac-orthodox church in Scandinavia and Nilous Paulus, priest at the Assyrian church, handed over the appeals in a heavy blue box. "Please remember that in this box there is the fate of thousand of real people that have suffered tremendously," Abdulahad Shabo said to the Swedish media. When Christina Byström was asked why the Swedish church stands behind the campaign, she said "We believe that this campaign is important because it sets focus on the hard conditions minorities in Iraq are living in today." Nilous Paulus said that he and the other Assyrian churches that he represented believe that the Swedish government and authorities are fighters for human rights and that they therefore will reconsider the rejections. The chief attorney of the Migration Board, Mikael Ribbenvik, said that it will take months before they have read every single appeal and that every case has to be treated individually according to the law. Ribbenvik has before said that while the situation is getting better in Iraq with less violence, the Migration Board is aware that it is actually getting worse for Assyrians and other minorities. Lena Blom reminded everyone about the children. Of the 3,000 cases there are 390 families hiding with children. "500 to 600 children are included in the appeals and my hope is that the Migration Board considers that when they review the cases." Meanwhile the closed Swedish centers where refugees are held in custody before being returned are full of Assyrian and other Iraqi refugees, as are also the hiding places for those that haven't yet being arrested by the police. AINA spoke to several Assyrians whose cases were turned over. A woman named Nadia has no one left in Iraq, her parents are dead and her brothers have left the country with their families. Though she has been working for the American forces and has been threatened by Islamic fundamentalists and many of her friends have been killed, Sweden has rejected her application. Now she is hiding in one of Stockholm's suburbs, surviving by working for less than $40 per day and always looking behind her shoulder for fear of being arrested and send back to Iraq. She is one of the fortunate ones. Most other refugees are in hiding and refuse to work for fear of being discovered. "Im very thankful to Nuri Kino's tireless work to help us with his reports and actions," she says, "but I'm getting tired and losing hope. This is my last chance and I'm praying that the Swedish Migration Board will reconsider mine and other Assyrians' applications. We would never have left what has been our homeland for more than 6,000 years if we were protected. And for me as a single woman it is impossible to live in Baghdad, where my family has lived for centuries." Nuri Kino himself is hopeful. "I think that the Migration Board will find errors in the asylum cases and give these people a chance to have a fair asylum process. And now the politicians have to open their eyes to the ongoing and escalating persecution of Assyrians and other minorities in Iraq."